Linda Sarsour giving her keynote address at the Fresno #Fight4All convening. Photo courtesy of The California Endowment. I had the privilege of attending the #Fight4All convening and interviewing many of the incredible speakers, but I was most excited to get to speak to none other than Linda Sarsour. A strong and courageous political activist who not only fights for her community, but for what is right, Sarsour is an influential and positive role model for youth everywhere. Hearing her speak empowered me and made me want to do more as a women of color. When I asked her what she would say to young people following in her footsteps, she explained to me how we are not only following in her footsteps, but she is also following in ours. 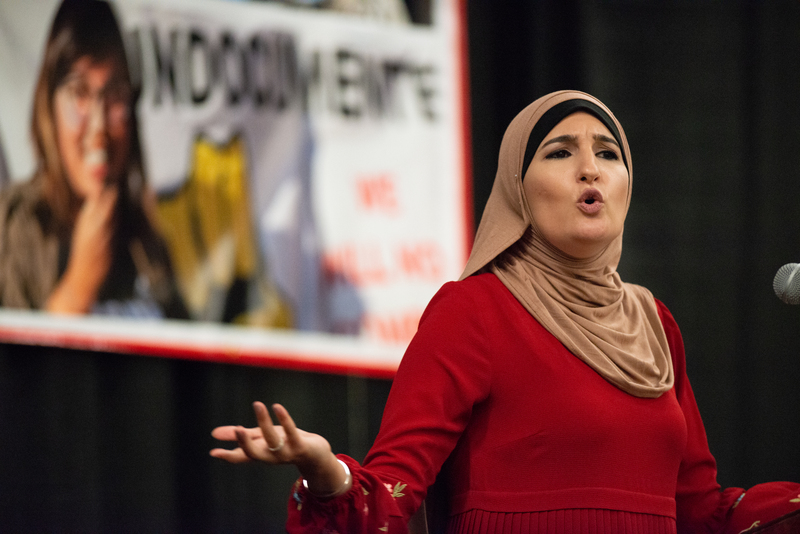 “Many young people are actually setting the example for people like me to be bold and fierce in this moment,” Sarsour said. Sarsour not only went to the Women’s March, but was the co-chair for the 2017 March. We talked a bit about the Women’s March here in Fresno, and Sarsour said something very memorable to me made me want to keep fighting with and for my fellow women. Reporter Zyanna Maynard and Linda Sarsour after their interview. Building community among women is so important and she knew that this is a time when it is most vital and significant. This spoke to me because, as a woman of color, I also know the challenges that come into play and the struggles as well. As a women of color I know that my voice won’t be shown in the media as much as a white male’s voice. During our time together, I also asked for her to look into the future and imagine what she wanted the world to look like for her children. Linda Sarsour wants what we all want, and that simply is to be happy and have the freedom to be who we are. Sarsour encourages all youth to fight for what is right, because they (we) are the future.